The National Library’s Rare Maps Collection forms part of the valuable Rare Materials Collection held in its Lee Kong Chian Reference Library. The collection contains topographic maps and navigational charts covering Singapore, Southeast Asia and Asia, as well as town plans and street maps of Singapore and Malaya. Majority of the maps were printed by European map-makers before 1945; these maps illustrate the development of European mapping of early Southeast Asia, as well as the history of the region. The David Parry Southeast Asian Map Collection constitutes 254 maps dating from the 15th to 19th centuries. The majority of the maps were originally published in atlases and books, which may no longer be available in their original edition or as a complete entity. 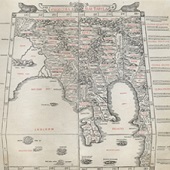 The collection contains maps produced by prominent cartographers of that period, including Gastaldi (c.1500–1565), Linschoten (1563–1611), Bellin (1703–72), Blaeu (1571–1638), Ortelius (1527–1598), Mercator (1512–1594), Hondius (1563–1612), Münster (1488–1552) and de Bry (1528–98), as well as several printed editions of Ptolemy maps, which include some of the earliest references to Singapore and the Malay Peninsula. This map is published in Josiah Burchett's A complete history of the most remarkable transactions at sea. It covers the Indian Ocean, Southeast Asia, China, Formosa, the Philippines and part of Australia. Published in The English pilot of 1711, this sea chart shows Java, Madura and the Straits of Bali. This engraved map of Batavia shows the surrounding countryside and forts. It is illustrated with people and animals in the fields and several ships in the harbour. The title cartouche is shown as the wall of a fortress. The map is from the English edition of Johan Nieuhoff's Gedenkwaerdige zee en lantreize.